During a sermon in Fairfax County, Virginia, Imam Shaker Elsayed endorsed the practice of female circumcision, saying that it was "the honorable thing for girls" in cases when it is necessary in order to prevent hypersexuality. "A Muslim gynecologist can tell you if you need to or not," he said, adding that the practice damages the woman's sexuality only if more is cut off than necessary. The Egyptian-born Shaker Elsayed, who has been the resident imam at Dar Al-Hijrah Islamic Center since June 2005 and served as Secretary-General of the Muslim American Society in 2000-2005, further warned that "in societies where circumcision of girls is completely prohibited, hypersexuality takes over the entire society, and a woman is not satisfied with one person, or two, or three." For another sermon by Imam Elsayed, in which he said that the children of Israel had slayed prophets, see MEMRI TV clip 5989. 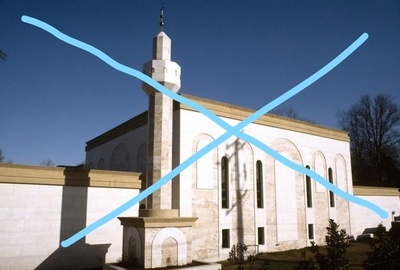 Dar Al-Hijrah was the mosque where top Al-Qaeda leader Anwar Al-Awlaki served as imam, including on 9/11. The Center for Islamic Pluralism is unalterably opposed to the Islamophobic atrocity of mutilating women, whatever the pretext. We call for an immediate shutdown of the alleged mosque of "Dar al-Kufr" in Falls Church, a new indictment of the gang inhabiting it, revocation of the U.S. citizenship of the despicable cleric described here, and expeditious deportation to his place of birth. The Satanic lair in Falls Church, Va. CIP image.